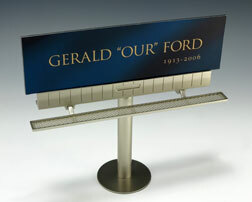 Miniature of the Gerald "Our" Ford billboard displayed throughout the nation during the month of mourning following Ford’s death on December 26, 2006. Silver stand and blue billboard. Design developed by Robert Jackson of Extra Credit Projects, Grand Rapids.